We have been getting a lot of snow here in Chicago. I am loving it. Don't hate me because I like winter. I ordered some beautiful handmade Twinrocker watercolor paper recently, and bought a couple of sheets of what they call "Turner Blue". I am so smitten with the robin's egg blue, and so this is my second painting working with it. It's not a bird I worked on at the museum, but I've always wanted to do a painting of one. This one is going up on my Etsy site, and I am hoping to do another larger painting of a Tundra swan on the same paper. I like the way the blue of the paper contrasts with the white ink. 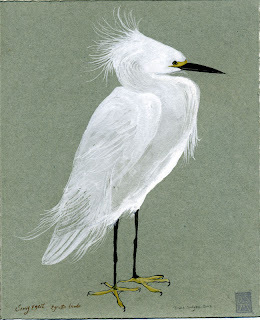 Snowy egrets are known, amongst other things, for their beautiful plumes used to spectacular effect in mating displays. They were one of many species of birds to suffer due to the women's hat industry in the 1880s, as their feathers were highly sought after. Although the snowy made a strong comeback in the mid-twentieth century,after the cessation of feather trade, numbers are again declining due to a very modern threat: loss of wetland habitat. That's a great painting. I saw a few of those a couple weekends ago on a bird photography trip that I took to the Georgia coast. I didnt get any fantastic shots of that type, but we saw a few at a lake packed with great egrets and various herons. I also LOVE winter :) The turner blue Twinrocker paper is just gorgeous. It makes this lovely egrets beauty stand out even more... I also love the seal with your initials...such a nice touch.